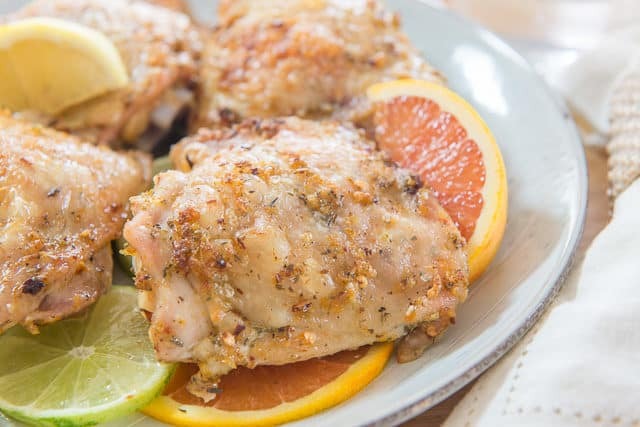 It only takes 5 minutes to mix together a flavorful Citrus Garlic Herb Rub that’s perfect on chicken thighs, chicken breast, whole chicken, and drumsticks. 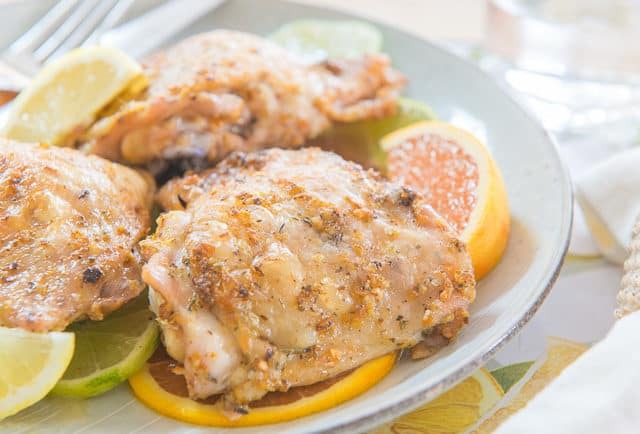 This is one of my favorite weeknight meals! I have a habit of underestimating how delicious recipes can be when the ingredients list looks really simple. I think, how good can this be? Where is the secret ingredient? But this recipe reminds me that magic can come from the simplest of combinations. 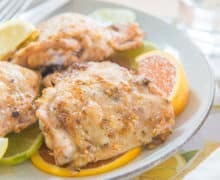 This rub combines fresh citrus zest, fresh garlic, dried oregano, red pepper flakes, salt, and a little oil to bring it all together. All simple. All readily available ingredients. And SO GOOD. The first time I tested out the recipe, I ate two pieces by myself, picking the second piece up with my hands and eating it like fried chicken. At that point I knew better and that I really just wanted to get at it with my face instead of taking my time with a fork and knife. 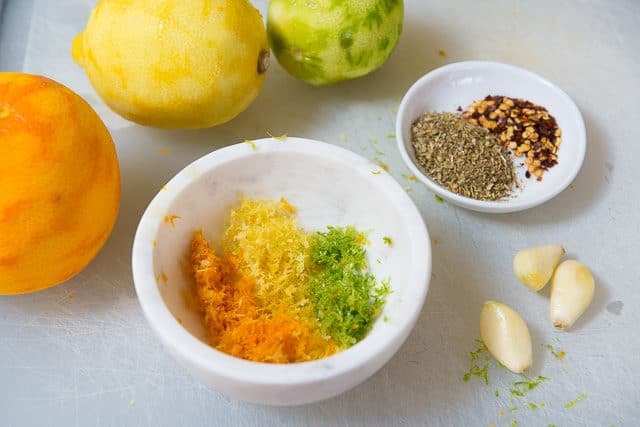 My inspiration for the ingredients has been the Citrus Palooza that has been going on lately. Seriously, thank goodness citrus season comes along in February, when my tolerance for winter is wearing thin and I become tempted to purchase the tiny containers of raspberries that run $5/pop, just to feel like it’s summer again. You can use any kind of orange for this, though I do recommend that you get the trio of citrus in there if you can. Here is a visual of the main flavors in the rub. It may not look like a lot of flavoring, but I’ve found it to be enough. Roast the chicken for about 25 minutes, or until the chicken reads a temperature of 180F. It doesn’t look like it in the photo, but the skin will be crispy after roasting, so it’s best to eat it immediately. Some side dish ideas to serve with the chicken are Homemade Steak Fries, a salad like this Shredded Zucchini Salad, Quinoa with Feta and Chia Seeds, and more! The flavors here are agreeable to all kinds of accompanying dishes. This rub can also be used for chicken breasts, drumsticks, and whole roasted chicken. 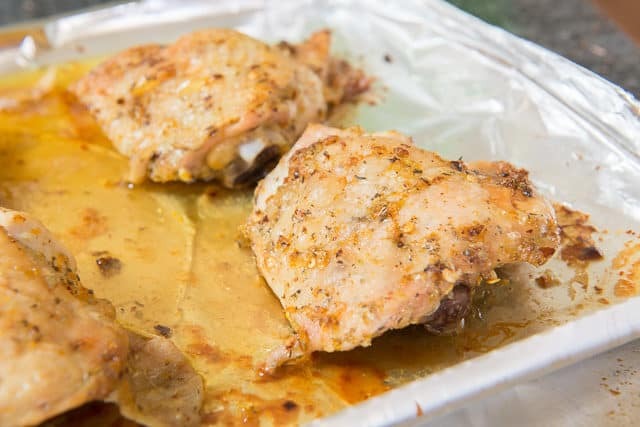 You may need to double the rub amounts if you’re doing the whole chicken, or increasing the number of pieces you’re making. 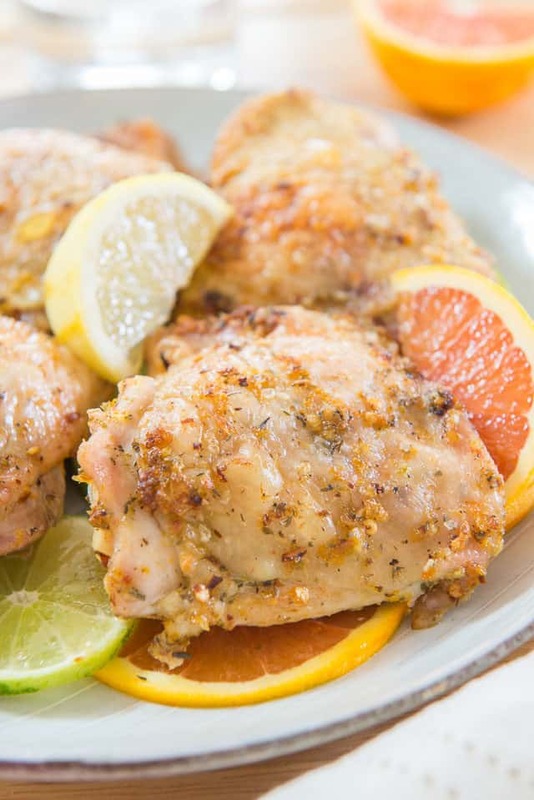 It only takes 5 minutes to mix together a flavorful Citrus Garlic Herb Rub that's perfect on chicken thighs, chicken breast, whole chicken, and drumsticks. 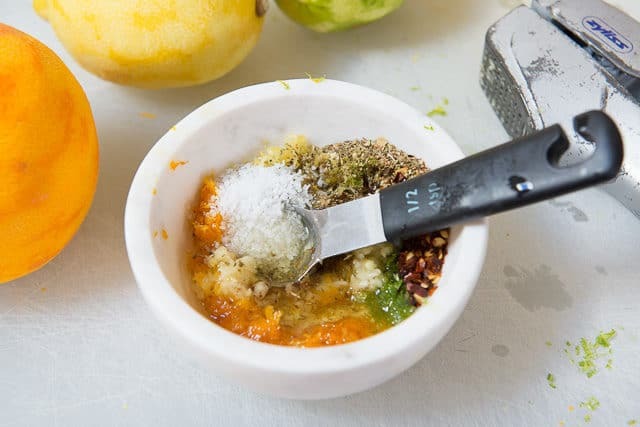 In a small bowl, stir to combine the citrus zest, garlic, dried oregano, red pepper flakes, salt, and avocado oil. 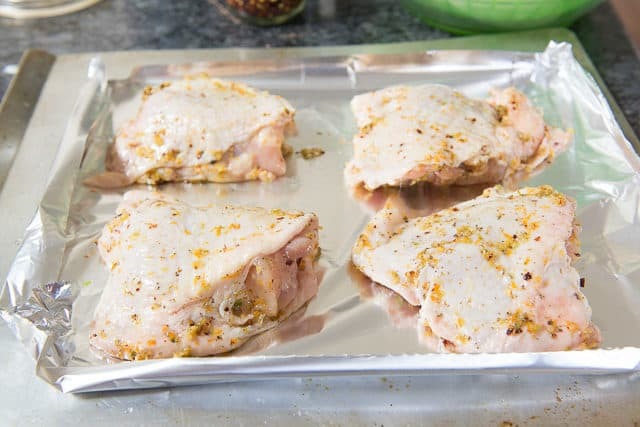 Place the chicken on a sheet pan, and rub the citrus garlic mixture all over the chicken, also getting some of the rub underneath the skin. Roast the chicken for about 25-30 minutes, until the temperature reads 180F, and the skin is crisp. *I put the garlic through a garlic press, which basically crushed it into a paste and distributes really well. If you don't have one, you can mince very finely with a knife, then use the side of the knife to mash it into a paste. **You can also use olive oil or any other neutral oil. Unexpectedly good. Lots of flavor, despite the short ingredients list!